The third Luce (DLG-7) was laid down by Bethlehem Steel Co. Quincy Mass. 1 October 1957; launched 11 December 1958; sponsored by Mrs. Felix B. Stump; and commissioned 20 May 1961 Comdr. David H. Bagley in command. On 20 August 1963 she steamed to the Caribbean for independent air surface and shore bombardment firings and returned Mayport 4 September. She joined TF 23 for intensive ASW and AA exercises 28 October and after a short operation with Enterprise (CVA(N)-65) was back in Mayport for tender availability. On 8 February 1964 she again joined the 6th Fleet and was called upon to stand guard for 3 weeks near the trouble-ridden island of Cyprus to evacuate American citizens if necessary. She hosted the Secretary of the Navy and Commander 6th Fleet 24 April fo r a missile firing demonstration and then escorted Shangri-La (CVA-38) on a high-speed Atlantic crossing to Mayport where she arrived 23 May. In July the ship steamed to New York City to participate in operation "Sail" with a regatta of sailing craft from all over the world. 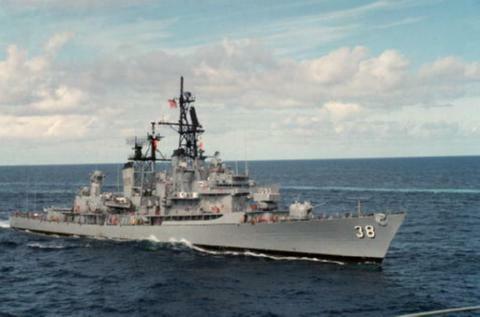 She returned to Mayport after a 4-month overhaul 28 January 1965. The frigate had won both the Engineering and Battle Eff iciency "E"s during 1964. Luce returned to the Caribbean for intensive refresher training in March 1965. On 29 April she embarked a company of marines at Guantanamo Bay and proceeded to the troubled Dominican Republic 30 April. She patrolled the coast of the politically dis turbed island until 8 May. She returned to the Mediterranean in June for 4 months of operations with units of the Spanish French Greek and Italian Navies In September she operated with Correy ( DD-817 ) in the Black Sea and she returned to the Mediterranean late in 1965. She arrived Mayport 6 November and embarked Commander Destroyer Squadron 8. In December she engaged in missile firing and after a brief time in port in 1966 continued testing and improving missile techniques and carrying out th e fleet's widespread peacekeeping activities which guard the free world. On 13 June 1966 Luce got underway for deployment with the 6th Fleet in the Mediterranean. After participating in various exercises with United States and other Allied ships and representing the United States at two international trade fairs she r eturned to Mayport on 26 October. The first half of 1967 saw Luce operating again with the 2nd Fleet in the Atlantic and Caribbean and participating in a midshipmen training cruise in June. On 7 August Luce began a regular overhaul at the U.S. Naval Shipyard Charleston S.C. She continued in orerhaul until early 1968 then operated locally and in the Caribbean until departing Mayport 14 September for the Persian Gulf sailing via Recife Brazil and various ports along the west and east c oasts of Africa. She arrived at Bahrein 29 October and continued to stand watch over the troubled Middle East into 1969.